"Just because your master is crazy doesn't mean his retainers have to act like madmen too." Few film franchises are as successful as that of Zatoichi, the blind swordsman. It generated 25 film sequels as well as 100 television episodes over a period of 20 or so years. This disc, the second of 17, continues the cinematic adventures of the sightless antihero. The sequel takes place about a year after the first picture. Zatoichi (Shintaru Katsu), also referred to as Ichi, is a blind masseur, a member of the lowest caste in feudal Japan. Giving a lord a massage, Zatoichi learns that he is utterly mad. The lord's retainers will stop at nothing to keep his madness secret, including murdering Zatoichi, who now knows too much. Complicating matters is a one-armed samurai on the run, Yoshiro (Kenzaburo Joh), who stole Zatoichi's love, Chiyo. This second picture is quite different in tone and structure from that of the first. Over 20 minutes shorter, it's much more taut and well-paced, without an ounce of fat on its bones. The character of Zatoichi is filled out a bit more as we learn somewhat of his backstory. But there's always the swordplay up front, and it's all well-choreographed if a bit antiseptic. 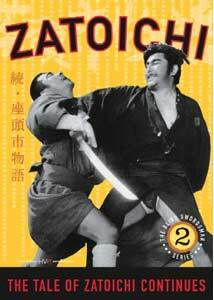 Zatoichi here takes on large crowds all at once, which gives rise to some dazzling swordplay. Katsu seems to be more comfortable with the character this outing, giving him a bit more expression and attitude. There are some scenes of domesticity with the geisha Setsu that are quite touching. The massage sequence that devolves into a tickle fight is quite odd all by itself and provides a humorous perspective on the character that was sorely lacking in the original picture. Kenzaburo Joh (Katsu's real-life brother) does a fine job of bringing resentment and a threatening character to the screen. There are numerous references to characters and events from the first picture, so I wouldn't recommend viewing them out of order. Image Transfer Review: Oddly enough, the widescreen scope picture is presented in nonanamorphic fashion. Viewers with widescreen sets will need to zoom it, which results in a picture that is lacking in fine detail and plagued with digital artifacts. Black levels are again extremely poor, averaging out to a light grey in most sequences. The source print appears to be in excellent condition, so it's truly a pity that this wasn't given an anamorphic transfer. I didn't notice the problems with cropping as much as on the first film; the only notable place is the copyright notice at the end, which is cropped at the bottom of the picture. Audio Transfer Review: The 2.0 Japanese mono sounds adequate for a picture of this age. There tends to be some hiss, noise and pops, but overall it's not terrible. The music seems a shade tinny and is rather lacking in bass. It's also occasionally somewhat warbly. Extras Review: There's not much here in the way of substantive extras beyond a decent set of production notes. Ten stills are presented on the disc in a size about 1/2 the screen. The keepcase contains four trading cards depicting scenes from various Zatoichi movies. Chaptering is adequate, but that's about all that can be said on this score. A sequel that manages to improve on the original classic Japanese sword drama, unfortunately given a mediocre transfer and little in the way of extras.